With over twenty years of industry experience, LFT Maintenance deliver building maintenance services to the commercial and private sectors, working on retail, commercial, and multi-residential schemes. We have an experienced management team and professional workforce who have worked on projects and schemes nationwide. We offer an extensive range of affordable building maintenance solutions, as well as complete façade installation and remediation. LFT conduct CWCT hose and Spray bar water testing. LFT has worked on some of the UK's leading landmark residential developments. Whether working with new commercial developments, or providing refurbishments to existing ones, we ensure the seamless handover and delivery of all projects. From maintenance to installation, LFT has worked nationwide on some of the largest retail developments. LFT is a UKAS accredited testing laboratory for site water testing. We undertake Hose and Spray Bar tests to CWCT, NHBC and AAMA standards and provide UKAS accredited test certificates. Hose Testing is designed to check the integrity of seals to ensure water-tightness hasn’t been compromised during construction and/or assembly of sealed units. Spray Bar Testing uses a flow and pressure controlled system to simulate natural rainfall, creating an accurate weather test for cladding and glazing systems. Hose Testing to closed jointed systems. With over 100m of industrial hose and IPAF, IRATA and PASMA trained staff, LFT covers all areas of water testing, using fully calibrated equipment to ensure accurate results. For opening vents, doors and windows. With 2m and 4m long spray bars, LFT can test both large and small areas. Glass polishing removes scratches, scuffs and pitting from glass. The damaged area is firstly refined using an abrasive pad, then completed with a compound to leave an "as new" finish to the surface. Our technicians can repair all types of glass – flat, curved, plate and toughened. With our background in installation and maintenance we’re able to remove capping, beads and gaskets where required, to access glass edges and ensure a perfect finish. All our technicians are IPAF and IRATA trained to help meet the demands of site access. LFT's focus on safety means all technicians are fit tested for dust masks. Our ongoing commitment to the protection of our clients' assets means that we’ll always bring dust-sheets and overshoes to site. We can also offer extra protection, with corex and self-adhesive floor protection, where required. 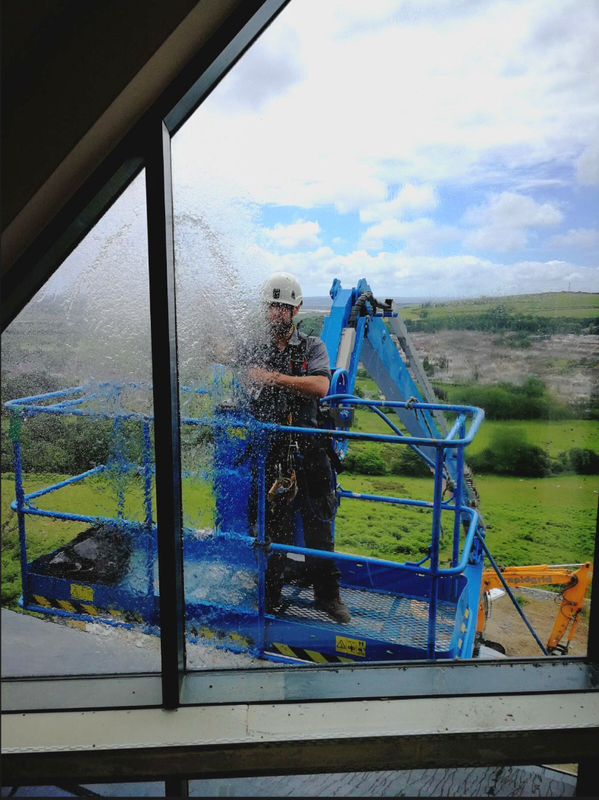 Our staff will always leave the workplace clean and tidy, cleaning any surrounding glass and panels in the work area following the completion of a project. Construction site accidents happen and when glass gets damaged it can be expensive and time consuming to resolve. LFT can remove scratches and other forms of glass damage quickly and cost effectively. Shop fronts are prone to vandalism and damage – LFT can quickly and cost effectively return glass to a like new finish. LFT’s team of IRATA trained abseilers make maintenance, cleaning and repairs easier, completing almost all tasks from ropes. This saves our clients both time and money, by removing the need for expensive scaffolding or access equipment. A team of trained abseilers access a high level space to make essential repairs, without the need for scaffolding. 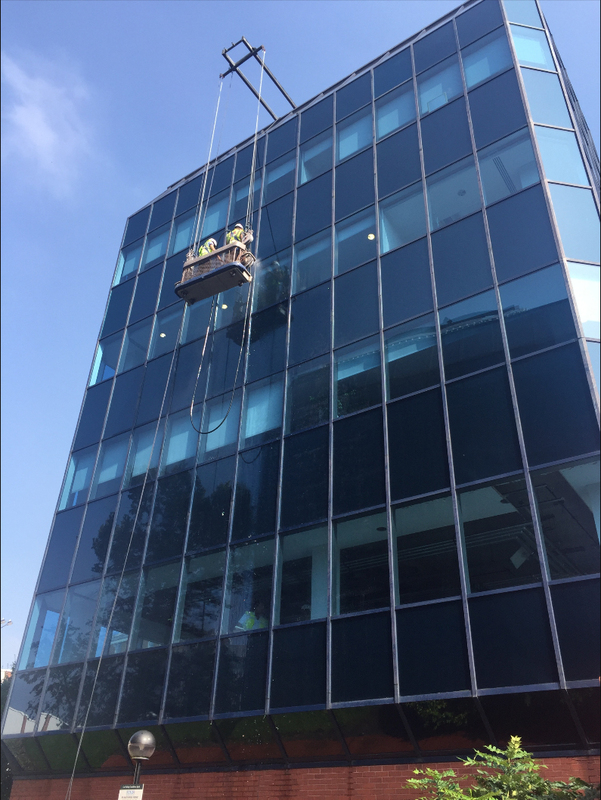 An abseiler is able to make an immediate assessment and repair of a glass panel, without the danger of further damage being done whilst waiting for expensive and time consuming access equipment. LFT specialise in multi-residential maintenance. We can offer a number of options, whether reactive one-off and emergency call-outs or scheduled cyclical services. LFT’s structure also allows us to act as main contractor, where managing specialist sub-contractors is required. This provides a single point of contact for our clients. Where an entire façade requires cleaning and/or maintenance, exterior lifts allow for a team to access and complete the task. Our trained experts can quickly and easily gain access to any part of a building to inspect and assess work. LFT offer a number of specialist and generalised painting options, including external facade colour changes to shopfronts and buildings. As well as spraying existing facades, we can also paint and re-decorate the communal areas of multi-residential and commercial sites. External surfaces are meticulously masked to avoid contamination of external areas whilst applying paint to both frames and cladding. LFT offers pull testing of anchor points, walkway lines, work position points, safety lines and site construction fixings. Using the latest calibrated equipment, we’re able to offer a fully certified service. We can install EN795 compliant abseil points and posts or re-certify existing ones. We’re also a CFA approved tester for site construction fixings. Our pull tests are carried out using the latest approved, calibrated equipment allowing us to provide a fully certified service. Being CFA approved, we’re the perfect choice if you’re looking for a tester for your site construction fixings. LFT’s multi-skilled installers have an extensive knowledge of all leading systems, including stick aluminium, unitised, cladding and rain-screen. Whether installing windows or complete facades, we feel confident that we’ll exceed your expectations. These glass panels can be pre-fabricated off site, which reduces time spent on site, whilst also allowing for speedier installation. This system allows for the construction of transparent partitions, which can be pre-fabricated off for quicker assembly on site.